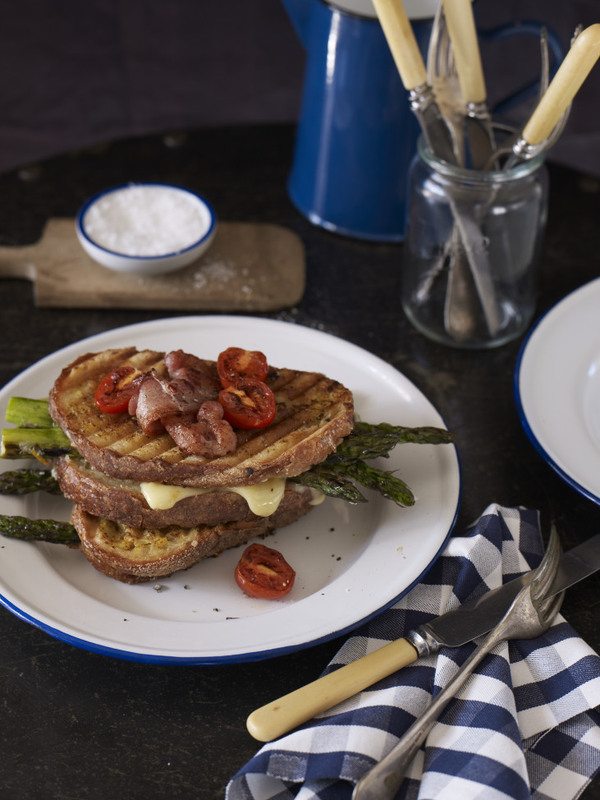 Grilled Swiss sandwiches with gruyere cheese: Perfect brunch! Brunch can easily slide into lunch when you serve these at the weekend. 1 Rub asparagus with olive oil and cook briefly on a barbecue grill or in a hot ridged grill pan. Transfer to a plate and sprinkle with sea salt, grind on a little black pepper and toss with lemon zest and parmesan. 2 Spread bread with butter and mustard, turn bread slices over and sandwich together with gruyère and asparagus, adding all the bits with the asparagus. Cook in a sandwich maker or non-stick frying pan until golden. Transfer to plates. 3 While sandwiches are grilling, fry bacon or pancetta in a smidgin of olive oil in a small frying pan until crisp; transfer to a plate lined with paper towels. Brown cherry tomatoes in the same pan. 4 Put a rasher or two of bacon or pancetta on top of each sandwich along with cherry tomatoes. Serve immediately.